Whilst football agents, the games infamous middle men, have been around since the early 1960’s , the term super-agent is only a recent arrival into the lexicon of association football. As money has flowed into the game, a powerful few have amassed enough resources to move from mere Agents to the grander media christened term ‘Super-Agents’. Empirically of course it is difficult to typologise super-agents given the somewhat blurred boundaries, but we are told they are the most powerful men in football, not mangers, players, leaders of the games governing bodies, but agents. Smaller provincial football clubs play key brokering roles in this network. For example smaller clubs in Portugal, for example Maritimo and Rio Ave FC. It appears that almost serve to be used as a trading hub, whether older players getting one last transfer, or a test bed for two years of a young star before being traded off in the football circus. This will be possibly at odds with the traditions and beliefs of the supporters. Clearly the network here only relates to Jorge Mendes and the players he represents. Therefore, this is not a clear portrayal of how the market is structured. 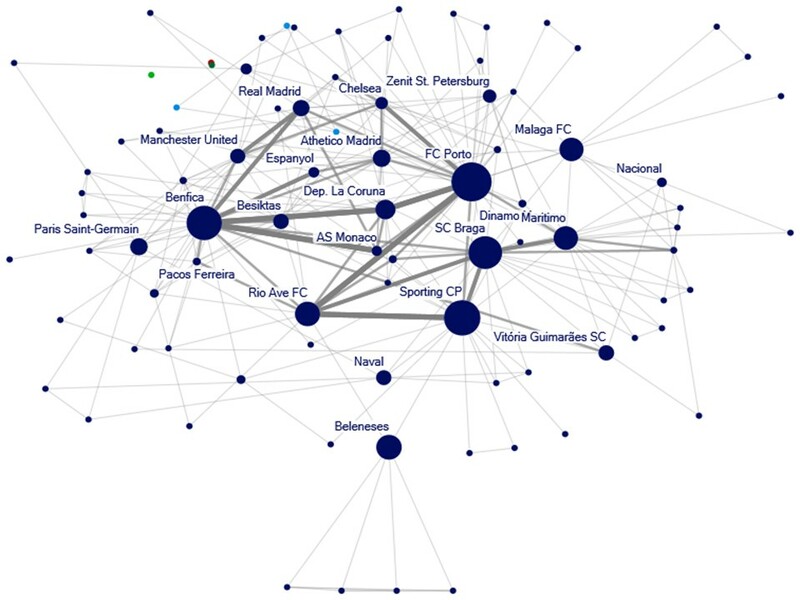 Yet this does offers an insight into the networked characteristics of trading between clubs that warrants further investigation and critical thought. In a further development straight out of a text book example of Michael Porters five forces, the Fosun group who have a minority stake in GetisFute and heavily connected to Jorge Mendes have entered into a new market and purchased a Football Club, it will be fascinating to view events unfolding at Wolverhampton Wanders founded in 1877. Indeed, it will be fascinating to see how Mendes and the Fosun group use Wolves to for their commercial gain.